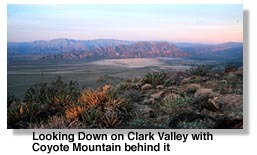 I have gotten around to climbing the 5,756-foot summit of Villager Peak just once. Taking my time, I did it over two nights and three progressively windier days in March. The beauty of the place brought a tear or two to my eyes. I am not exactly a praying person, but I did think to thank God for having put it there. From Borrego Springs, the California village that is headquarters for the Anza-Borrego Desert State Park, you can get a long view of Villager Peak by looking at the mountains to the east. 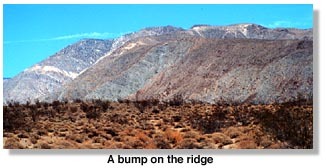 It's just a bump on the long ridge that runs north from the S-22 road just past Clark Dry Lake. If your eyesight is good, you will see a lot of greenery resembling (except for the color) the stubble on the face of a man who hasn't shaved in a few days. Villager Peak sits in a juniper-pinyon woodland, and the green objects are trees: pinyon pines, junipers and nolinas. So what's the big deal over a bump on a ridge? 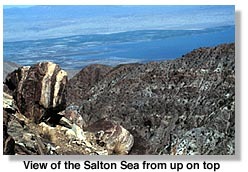 For me, it's the feeling of climbing nearly 5,000 feet over more than six miles of rough, steep, dry, rocky, and barely hospitable terrain, and finally getting my first distant look at the Salton Sea on the other side. It's the feeling of coming to the peaceful park-like setting of Villager where a grove of pinyon pines and unusually fat nolina trees encompass and embrace me. The second part is the challenge of getting myself back down again when my knees begin to wobble and the atmosphere is cold and windy. From a distance, it looks like a quiet, peaceful, serene sort of ridge, but when you plant your feet on it, it's like stepping into a snakepit. My first destination was the easternmost toe of the Lute fault scarp about a mile away from the head of the Thimble Trail on the S-22 Road. The Thimble Trail goes south to the Borrego Badlands, but my route was north sometimes on a trail, sometimes not. The sandy, slightly uphill terrain is punctuated with enough creosote bushes, ocotillo plants and gullies to keep a person from walking a straight line, so I kept looking ahead to be sure I was staying on course. I also kept stopping to turn around to memorize the terrain so I would know where to look for my car when I went home. As the cactus wren flies, it's about half a mile from the fault scarp to the base of the ridge, but it's a tough and tricky half mile. 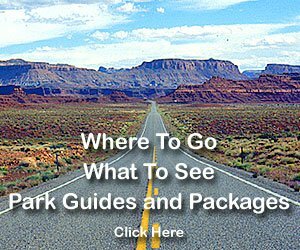 You've got to get to and cross Rattlesnake Canyon Wash, passing through a nerve-wracking entanglement of desert varnished rocks of all sizes and gullies that you maddeningly hit on the bias. The first time I tried it, I foolishly didn't pick up a trail. I ended up on a bluff where I looked at what would have been a treacherous descent to the wash below, so I meekly retraced my steps and tried again. At the base of the ridge, on the dry arroyo from Rattlesnake Canyon, I found the trail upward, a steep, deep and ugly gash that climbers have gouged out of the side of the ridge without much concern for its impact on the soil. I climbed the face of the ridge, thinking I might qualify for the title role in a Spiderman movie. When I got to the top, I turned around and looked down, and it was as if I had just scaled the side of a 10-story building. I resumed my walking. At first the ground was slightly uphill and covered with small stones. Through the passage of time, the stones had become embedded and were almost one with the ground. I decided that if I used my inflatable mattress I could sleep here comfortably among the widely scattered ocotillo, barrel cactus and cholla. If I was coming down the mountain and it grew dark before I could get to my car, that might be useful information. Stones and rocks are a major feature of this ridge. They come in all manner of shapes and sizes: small and large, flat and round. The ridge is home to plenty of lizards, but I wouldn't call it a paradise for bird watchers or animal lovers. A person would be well advised to watch out for ticks. In spring, or anytime enough rain falls to nurture flowers, it's possible to come up here and see them. But mostly, this is a place where life survives in spite of the odds posed by the elements. It is not a place where life exactly flourishes. The Saguaro often begins life in the shelter of a "nurse" tree or shrub which can provide a shaded, moister habitat for the germination of life. The Saguaro grows very slowly -- perhaps an inch a year -- but to a great height, 15 to 50 feet. A food chain constitutes a complex network of organisms, from plants to animals, through which energy, derived from the sun, flows in the form of organic matter and dissipates in the form of waste heat. 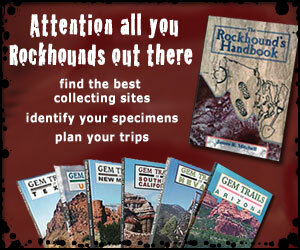 Prickly pear cactus are found in all of the deserts of the American Southwest. Most prickly pears have large spines on their stems and vary in height from less than a foot to 6 or 7 feet.